The most surprising thing about the Volkswagen ID Buzz, besides the little garden gnome rotating a quarter inch above the dashboard in a perpetual lotus position, is that so much of the stuff inside actually works. The ID Buzz is a concept vehicle. VW (VLKPF) has announced plans to put something like it into production in a few years. For now, though, the futuristic electric microbus is just a fleshed out idea, the sort of thing designed to excite crowds at car shows. Concept cars, if they drive at all, usually do so just to get up on a show stand. There's no power assistance for the brakes or steering, doors open and close with a rattle, and the interior's dials and lights often don't function. Not in the ID Buzz, though. OK, the windows do not open and the central "computer screen" shows a frozen map. 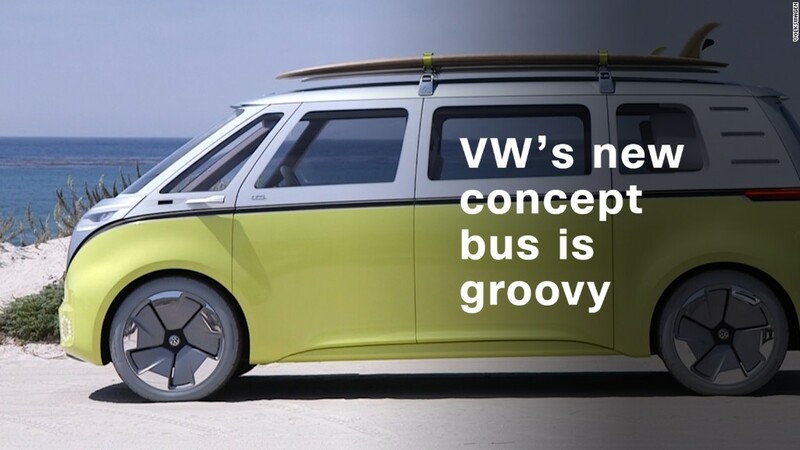 It'll be all electric but the big attraction will be the classic Volkswagen microbus look. But, the interior and exterior all light up like a sample-sized Times Square. The doors -- both in front as well as the sliding back doors -- open and close on their own when you lay a finger on lighted symbols along the arm rest or wall. And, of course, there is that gnome. Someone at VW spent real time making that pointy-hatted little guy float and spin. The van bounced down a short piece of California beachfront road on its gray show car tires. When I hit the brake pedal, labeled with a "Pause" symbol, they felt reassuringly robust, or at least they did in a slow-moving van. The steering pulls away into the dashboard to prepare for autonomous driving. 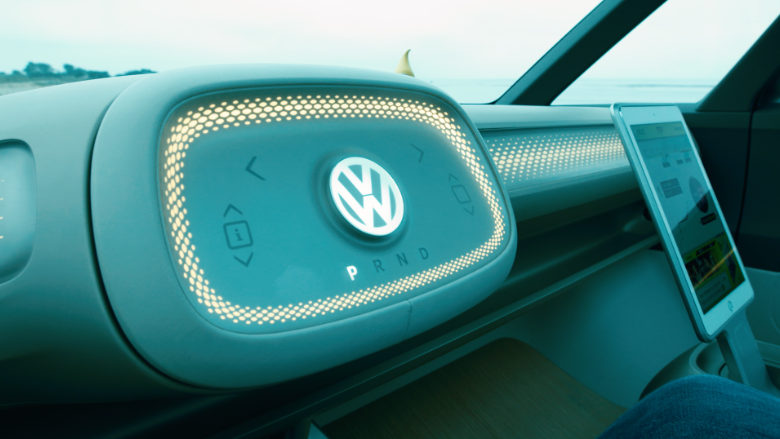 The VW ID Buzz is supposed to be able to drive autonomously. That's another thing that is fantasy car fiction. It can't really. But the steering wheel does actually retract as it would when the bus shifts into "autonomous mode." Having driven the ID Buzz, however, I am now fairly certain the production car, due in 2022, will not have a rectangular steering wheel. Yes, round steering wheels are boring and conformist. But the great thing about a circle is that it's always the same no matter how much you turn it. With a rectangle, you keep having to keep looking down during tight maneuvers to see which way the rectangle is going. The main point about the ID Buzz is the way it looks. Volkswagen has made lots of good and perfectly functional vans over the years but fans have been begging for a remake of the bus. It will come in the form of this little electric van. 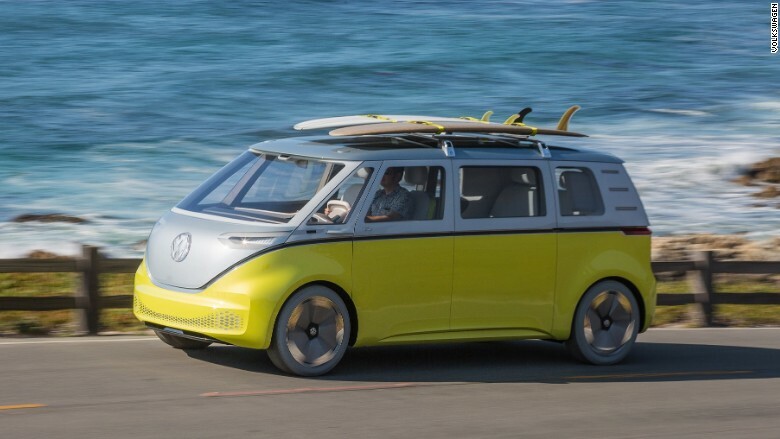 VW executives promise it will look a lot like the ID Buzz. I just hope the gnome makes it into production.